Across the street from our house they are "pouring" and a new second floor roof. The process is fascinating. Take a good look at the photo. A handmade tall ladder with platforms every eight feet or so. On each platform there is one man and they are all facing each other. The men on the the ground are mixing cement from raw materials that were dumped in the road during the past two days. After it's mixed, a couple shovel fulls are scooped into metal pails about the size of a spaghetti pot. Then each pail is passed up the ladder from one man to the next. At the top it's dumped into a wheelbarrow. The empty pails are threaded on a rope and slid down a zip line to the ground. They have at least nine pails in motion the whole time. When the wheelbarrow is full it's rolled along a board to the spot on the roof where they need the cement. This roof is at least 18 feet wide hand 40 feet long. The men have been doing this continuously for at least the last 4 hours without a break! 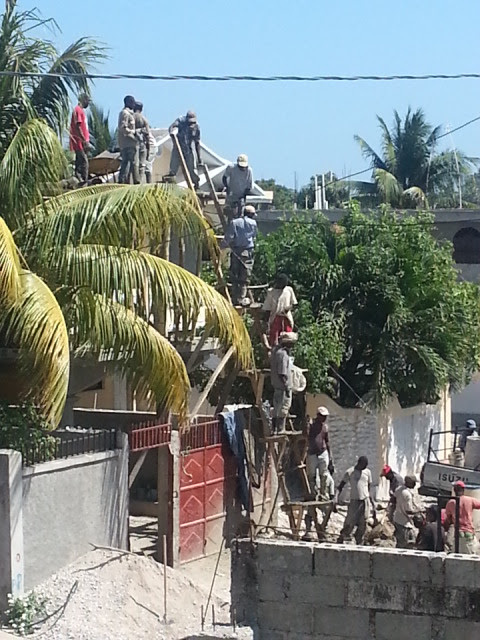 Each man on the ladder has been bending and lifting over his shoulder for that long!! It is in point of fact a nice and useful piece of information. I'm satisfied that you simply shared this useful information with us. Please stay us informed like this.